Greetings from Renxkyoko Iglesias ! Oh, yes ! ! My Mom and I just discussed about the possibility of going on another trip next summer. This time, we’ll go to Asia, specifically, Philippines, ( of course ), Japan, Thailand, Singapore , and South Korea. This depends on my employer though. Believe it or not, I have to sound them off one year early, like I did before we went to Europe. My cousin is coming with us , of course, and guess what, her boyfriend too. She’s 14 now, she was 13 when we went to Europe and she’ll be 15 when we go to Asia. There’s a 99 % probability her Bf is going with us. His mother is so happy with the invitation and already asking how much the trip would cost. I don’t know if she could come up with $ 1,466 by January , 2014 ( We buy the tickets for Manila, Philippines in January,) and additional $1,500 ( for Asian tour) by June , 2014. My cousin and her Bf are childhood friends and have been classmates since first grade. Sweet ! I don’t know if their relationship’s going to survive though. His mom likes my cousin very much. She always takes her to go shopping, go to the movies, and just last week, they went on a 3 day vacation in Monterey, California. Ah, young love ! I’m jealous. Should I do a countdown again? Last year, I was like, yay, 7 months to go ! 4 months ! 1 month ! Then on the day we left for Europe, I posted something like, I’m leaving for San Francisco Airport in 1 hour. Now for our Asian tour, it’s , 11 months to go !! I guess I’ll do a countdown then. Oh, newsflash ! The BF’s parents and grandparents will come up with the money. Totally approved ! It will be fun to have a 15 year old boy coming with us, and hear his comments and opinions. I don’t know if it’s relevant but BF is a white guy, so I’m sure he will kind of stand out among us brown folks. 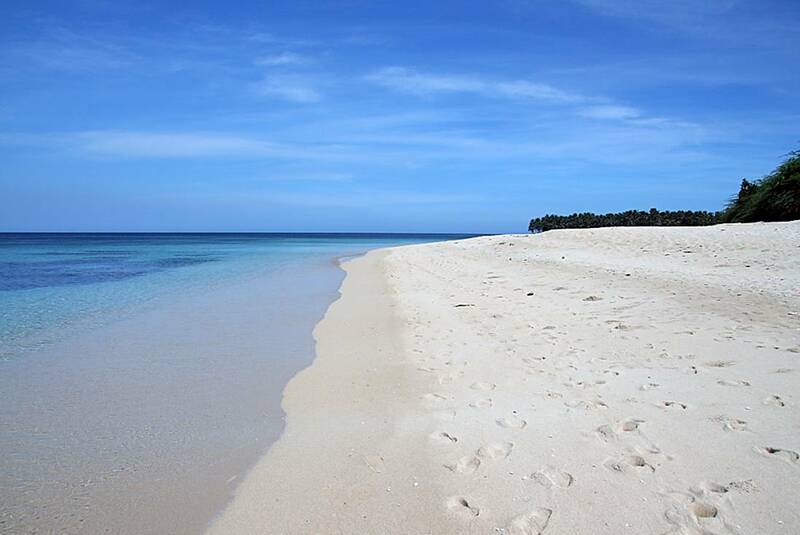 he he he And I don’t know if some of the readers have read my posts where I mentioned that we have a beach property in one of the top ten best beaches in the world, Boracay island , and that my aunt and parents ( on joint venture ) are going to build a beach /vacation house there soon. Well, construction has finally started and I’m sure it will be finished in 3 months. Also, we are going to rent it out on daily basis, so if my readers from the Philippines are interested, contact me here on WordPress for reservation. Ha ha ha ( Ha ! 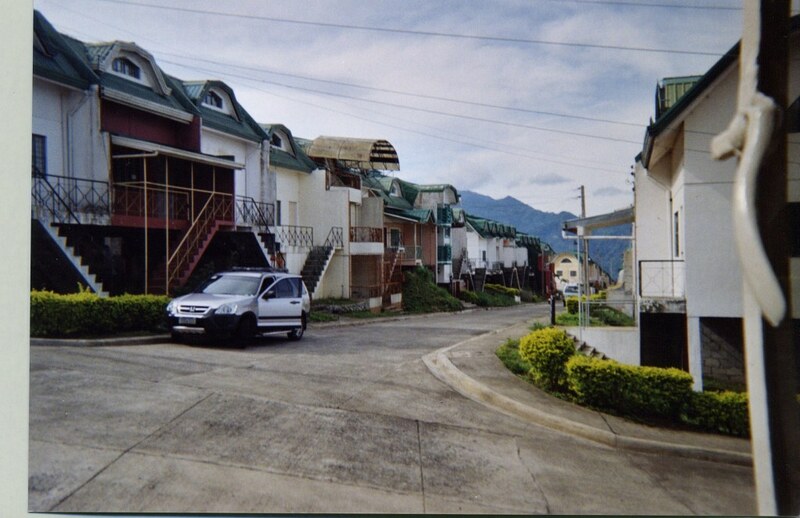 I’m into business mode again…..well, my parents are into rental business in the Philippines… apartments and condo units, oh, and a townhouse in Baguio, Mt. Province, which we’ll be renting out on a daily basis for vacationers ) Is this allowed by WordPress? Filipinos do love to dance. Philippine inmates, 70% of whom are high risk criminals, are taught to dance as part of their rehabilitaion. 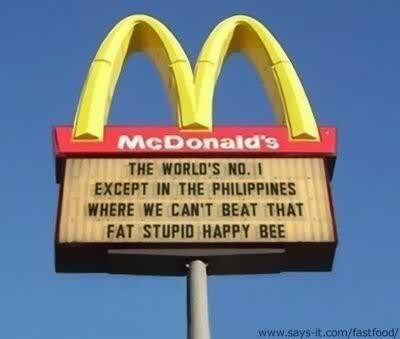 Filipinos are either crazy or have a good sense of humour. Did I just say Filipinos are crazy? 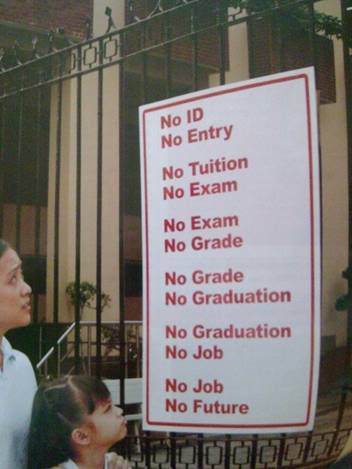 That sign was seen at a school’s gate. 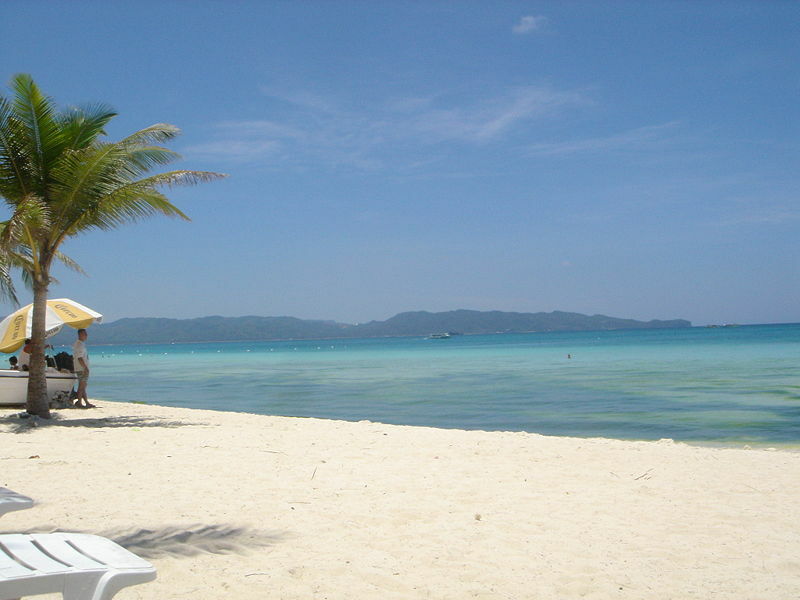 Below is a picture of the beach at Boracay Island. 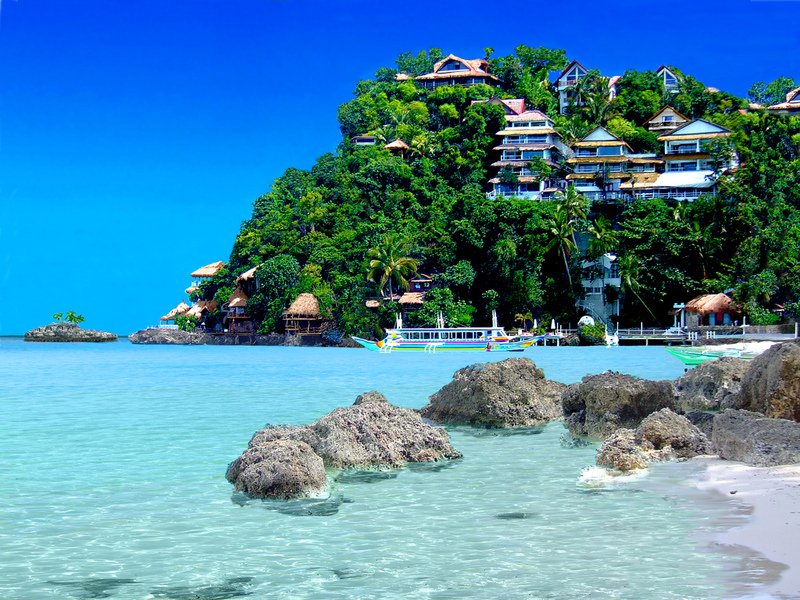 It was voted as the Best Beach in the World in 2012. By the way, our beach property is right behind Shangrila Hotel… in fact, we share the same property line. We were afraid they might even have taken a few feet off our property. Big corporations are like that, right? And that Shangrila Hotel land used to be owned by my great grandmother. Her heirs sold off that big chunk of land to the hotel conglomerate. * shakes head * I don’t like it when big corporations come in. Somehow they destroy the pristine beauty of a place. I just wrote that my mind was blank, but here I go again chatting and blabberring endlessly. I suddenly got excited about our next trip while writing this , so pardon me. Gaaaah ! I’m supposed to post about my Paris tour but I ‘ve chatted too much. Next post, okay ? 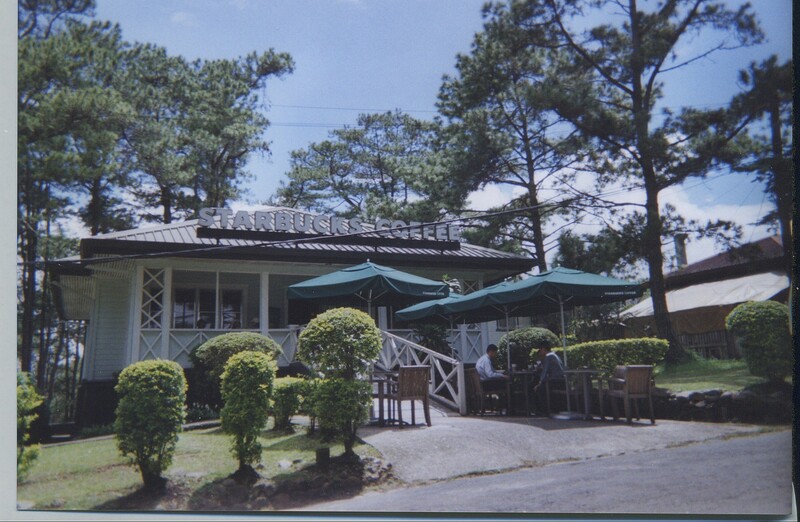 While I’m at it, I’d better make use of this post and advertise about our Baguio townhouse for Philippine readers of this post. 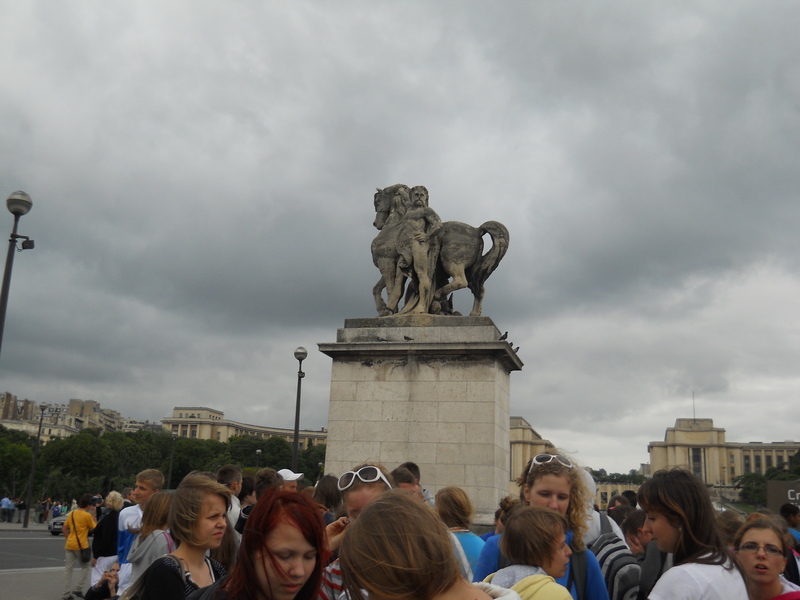 The pictures were taken when we were there on vacation 2 years ago. Some of the units are still unfinished in the picture so the place doesn’t look much. By the way, the place is a mountain resort. 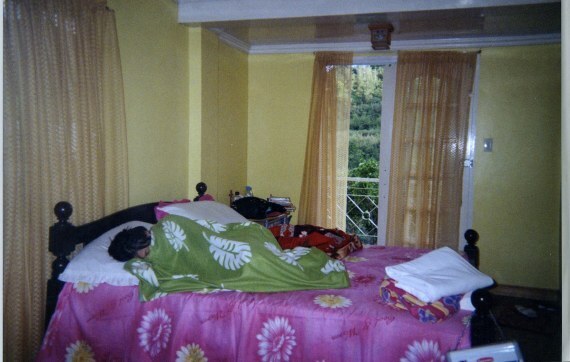 That’s me sleeping…. 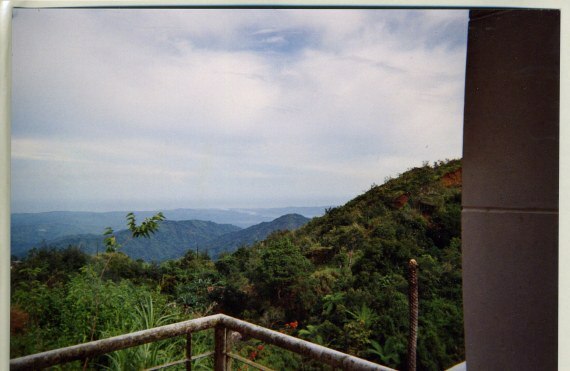 you can see the veranda , the house is hanging for dear life on a cliff, but the view is spectacular from the veranda. Below are the million-dollar views from the bedrooms. The townhouse has 3 floors, and the bedroom shown here is on the second floor. The pictures were taken using a disposable camera ! He he he I’ll take better photos next time. That’s yours truly in Bagui 2 years ago. 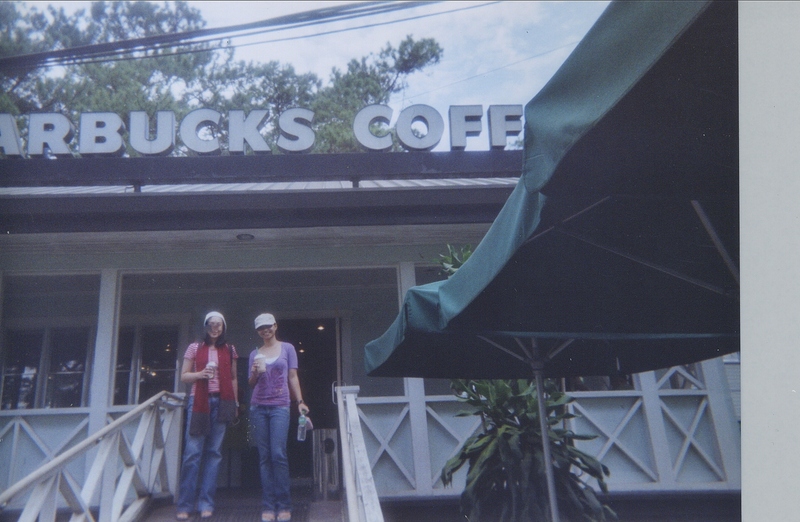 The ubiquitous Starbucks. I couldn’t believe when I saw it there up in the mountains. The lady in the picture with me is my cousin, a very pretty medical doctor. I masked her face though. 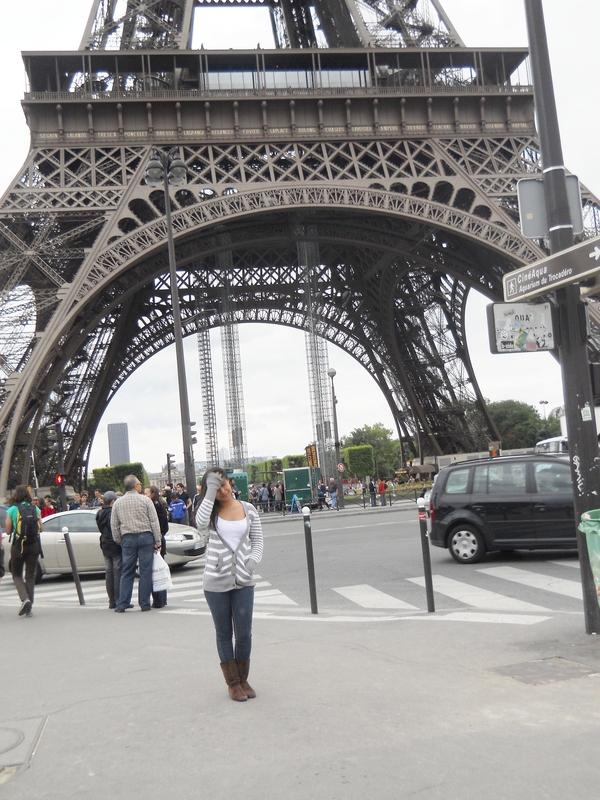 The photo of me is the ugliest so far, but I love it.Bahahaha ! 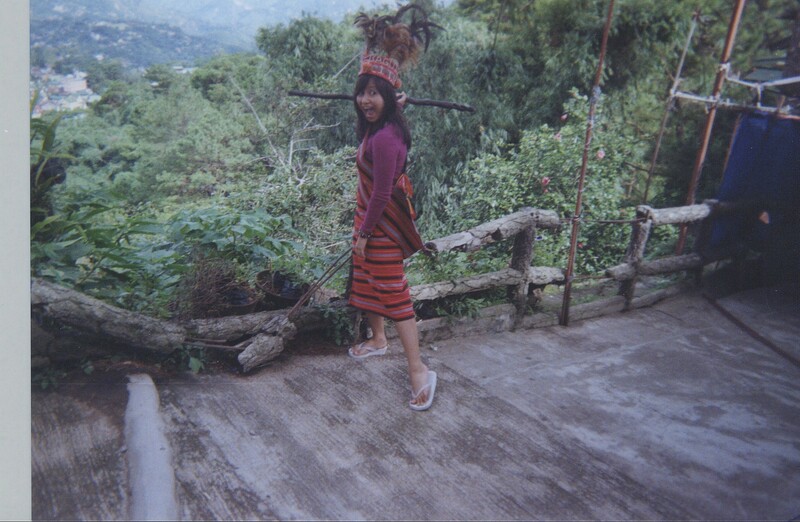 I’m wearing a tribal costume here. 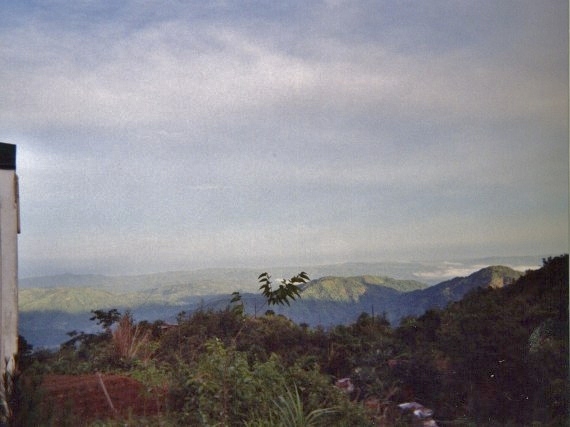 This is a mountain resort in the Mountain Province. I doubt indegenous people of this province still wear this attire. This is for tourists. 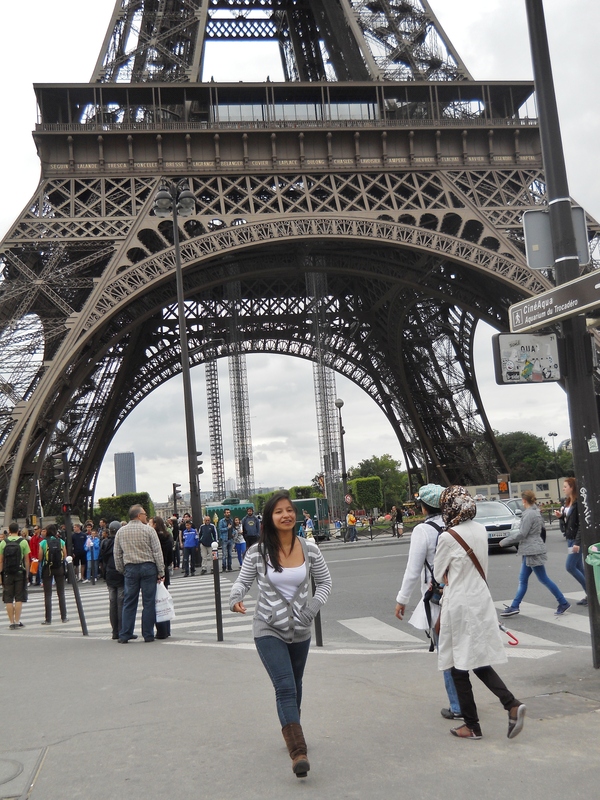 LOL I jumped from France to the Philippines ! But I’m hyped. And to think I started so lame and dull ! 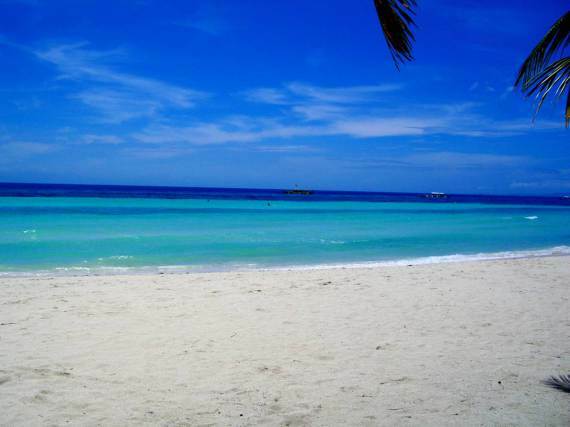 Boracay Beach ! Woooh ! It’s on ! Construction has began ! ! * I see dollar signs* Anyway, there’s no one living in the house. It’s our relatives who use the house and bring friends, and that kinda annoys me. 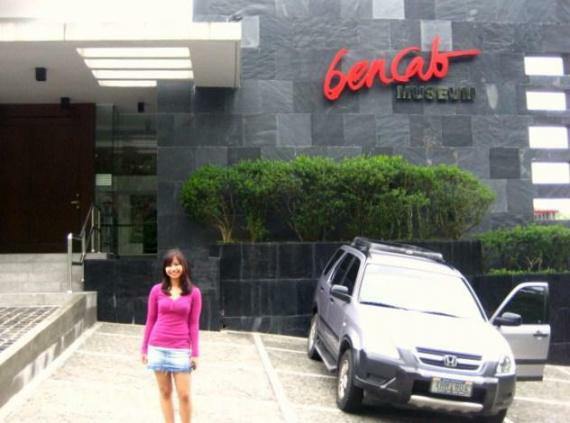 A week before we went there, the whole cast of one noontime TV show were there for a week, and forgot to close the windows…. it rained , so the living room got all wet, including the furniture. ( A TV star is the GF of the son of a family friend ). They paid for the damage with microwave oven and toaster. o.Oa Oh, well. Anyway, the townhouse is up for rent on a daily basis. We still have to figure out how much. Okay, this is all for now. Our second day in Paris, France is next. Good day to all. Be good, be nice, be cool. PEACE ! Gaaaah ! This post is so random. Hi, there ! Renxkyoko Iglesias here. Three days ago, I fainted at my workplace due to heatstroke. It was more like a black-out. You see, for almost a week now, we’ve been getting 3 digit temperatures here in our neck of the woods. Yesterday, the 4th of July, the temperature was 108F. ( ~ 42 C ). On the day I blacked out, the temp was 110F . Driving to work was worse for me because the A/C in my car was not working… and well, you know how it is, the temp in the car is usually 10 degrees higher initially. Opening the windows didn’t help at all. It was a tortuous 30 minute drive to my workplace. Anyway, as soon as I got out of the car, I felt a bit woozy, then as I was walking to the store, I knew I was about to black out. First, my vision turned greenish- orangy, then in slow motion, it turned grayish. It was thru sheer will power that I managed not to collapse on the pavement. As soon as I reached the store entrance , I let go and keeled over. My co-workers called 911. The paramedics came and easily revived me. When I came to, the paramedic asked if I had breakfast before I came to work. I said ” Yes, I ate a big Sio-Pao.” They all laughed. He he…. I thought that was funny too. I mean, I could have just said, ” Yes, I did “, or just nodded . I’m sure they didn’t even know what a Sio-Pao is. 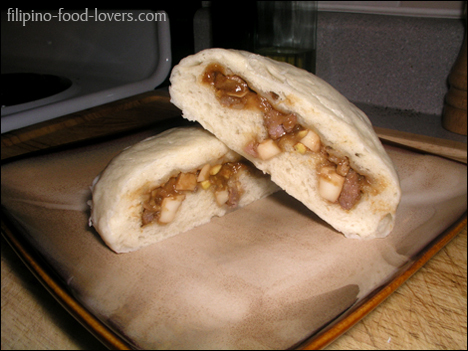 Well, that’s a meatbun. When the paramedics left, I just had to ask my co-workers, ” Guys, was my nouth open? Did I drool? Did the cute paramedic see something inappropriate?” ( I was wearing a stretch hip -hugging mini skirt ) Anyway, that was actually the 3rd time something like this happened to me, so I knew what was coming. Oh, well, tough luck. I’m one of those who are prone to heatstrokes. But honestly, it wasn’t just my sensitiveness ( or is it sensitivity ? ) to heat that I blacked out. That day, I didn’t get to sleep at all….. not a wink. Why, you ask. Well, I was reading a manga but I didn’t like where the story was going and got really p*ssed at and agitated by the main guy’s douchebaggery . Pardon the language but I was like this after reading…..
And I thought ” I need a spoiler ! A spoiler !!!! I wanna know what happens ! I need to find the rawssssss!!!! ! 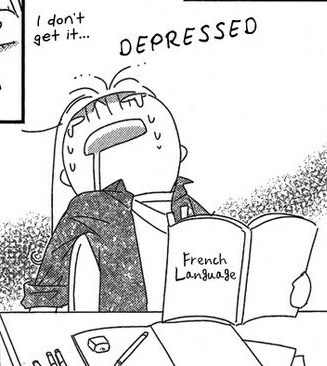 ” I did find the raws but , of course it was in Japanese. Normally I get the story just by looking at the drawings, but this time, I wanted to know what they’re saying. So I looked for another language that I could Google translate to English, and found one in French.. 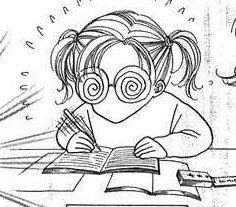 I translated at least 5 volumes the whole night, til 7 AM.. Hey, it wasn’t easy. Oh, Sweet revenge ! It was so satisfying to know that the main guy gets his comeuppance later in the story. But of course , he still gets a happy ending with the main girl. Boooo ! So, on to gay Paree !! 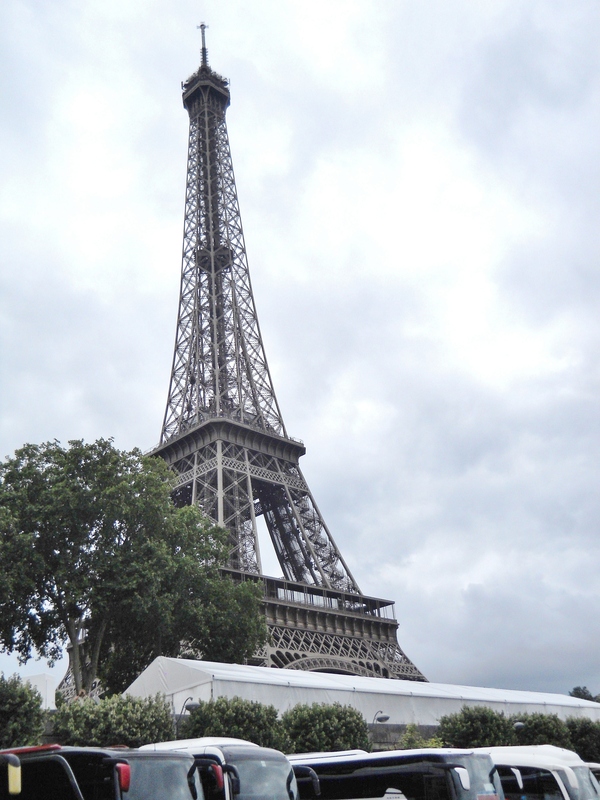 I don’t think Paris and the Eiffel Tower need an introduction. So I’ll just post pictures if that’s okay with you. 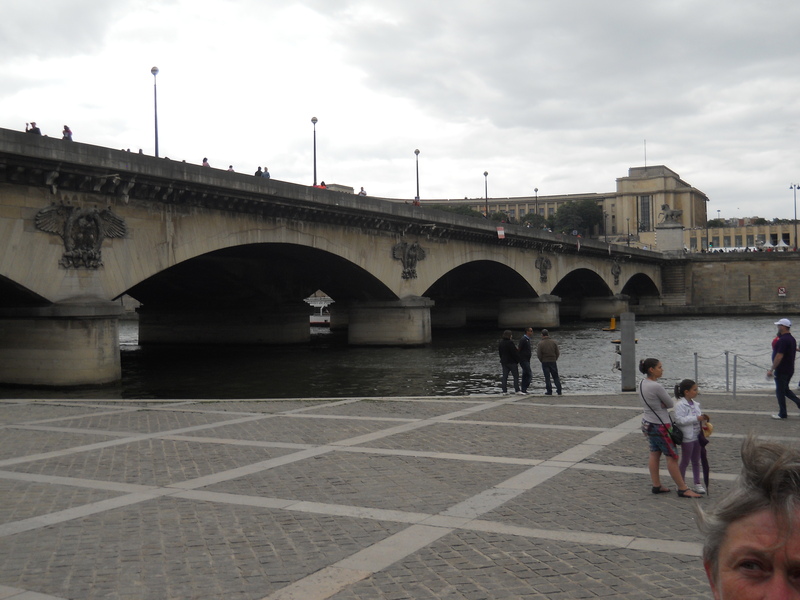 Above is the famous Seine River, just a few meters from the tower. You know, I don’t know if this is true all over Europe but I noticed something in France. 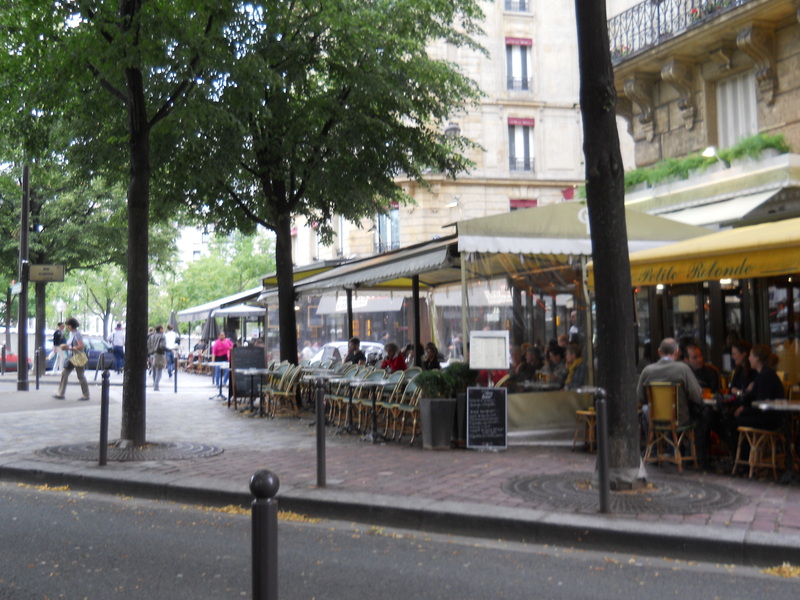 Most of the outdoor cafes have chairs facing the street. I wonder if this is for people- watching. 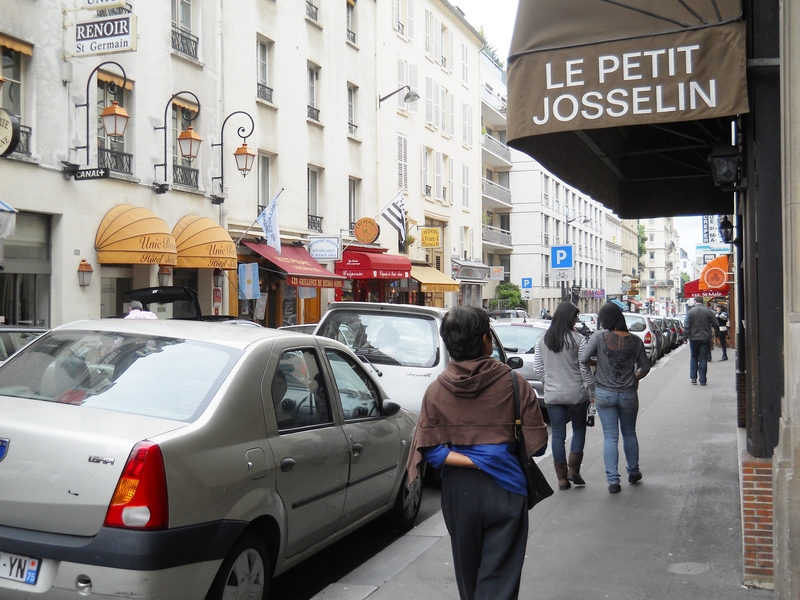 This is the Monpartnasse area, located on the Left bank of the Seine River. 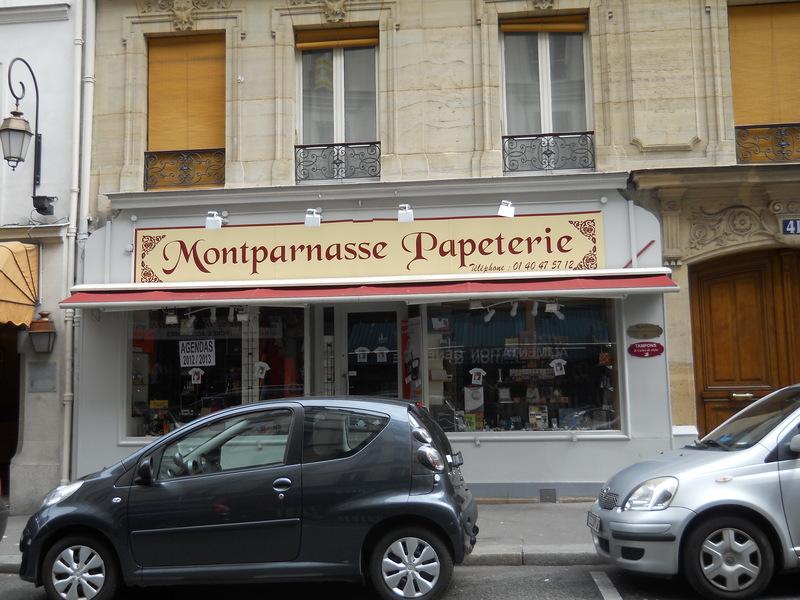 Montpartnasse used to be the meeting ground of artists from all over the world, mostly penniless, but they all thrived happily in poverty…. Picasso, Chagall, Ernest Hemingway,Degas, Salvador Dali, Diego Rivera, henri Rousseau, James Joyce, Modigliani. The artists/painters used to sell their paintings for a few francs for food. Now their works are worth millions of Euros. 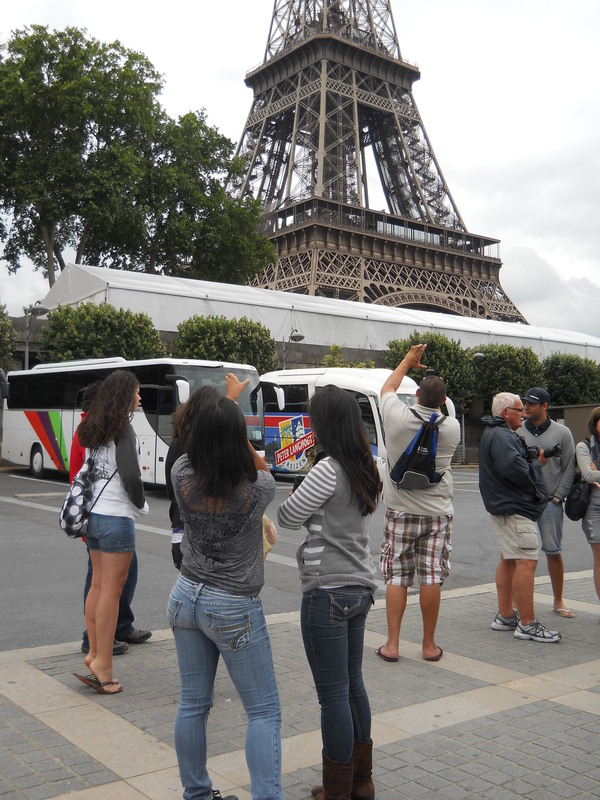 This was our first day in Paris. 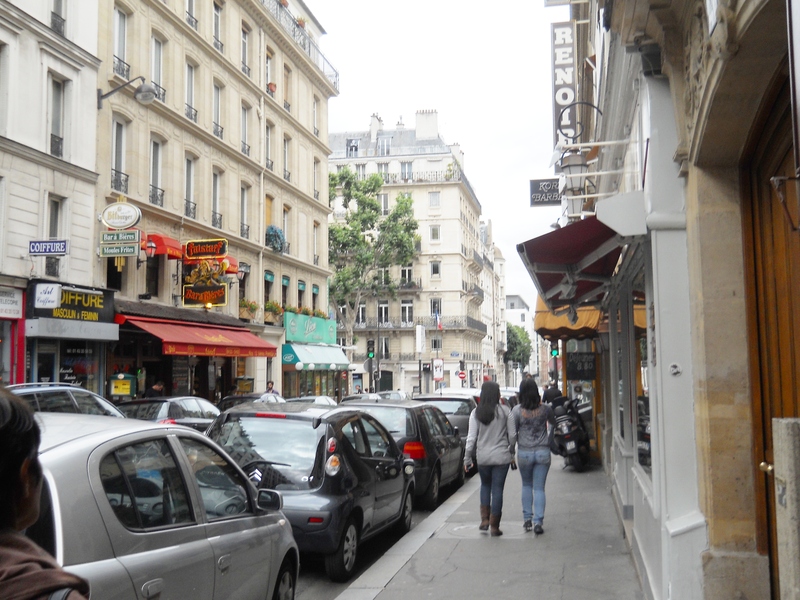 We arrived in the afternoon, walked around Montpartnasse, had coffee and petit fours at a sidewalk cafe, checked out the outdoor artists’ market, ( most of the shops were closed… it was a Sunday afternoon ), after which we went to see The Eiffel Tower. 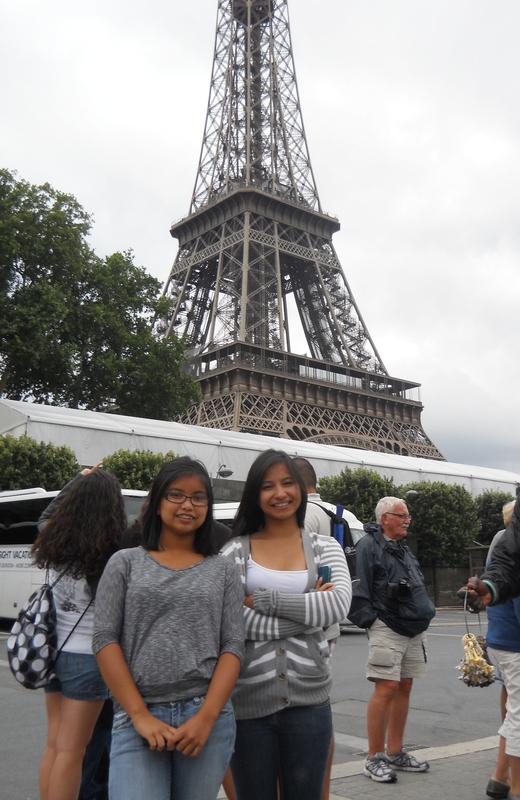 We’d go to the tower three times during our stay in Paris, which was 3 days. Alright, this is all for now. Good day to all, and PEACE.